It must be Sunday, because I am sitting here at my computer trying to put together another blog post! Despite the best of intentions, I only seem to be able to put together one, perhaps two, posts per week. So much going on and no time to write about it. Nationwide was a great success and we are all just composing ourselves and trying to take in the spotlight. I think we all appreciated the spotlight and here's to hoping that the artisans that need Craft in Kerry find us! 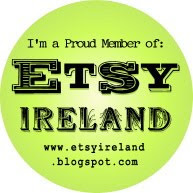 Sadly, they edited out our contact details in the interview, but people are quite good at Googling these days, so they should find us either on our blog on http://craftinkerry.blogspot.com/ or on our Facebook page. Our craft showcase went well and I have plenty of hand-dyed yarns left, if anyone gets itchy fingers to start a new knitting or crocheting project! I need to get busy as there are plenty of new babies showing up in our circle of friends. A friend of mine, having her third baby, was sure she would be overdue again, but that baby just could not stand the idea of hospital and she ended up delivering him HERSELF in the bathroom! I about died when she sent me a text with the news. Mother and baby are doing wonderfully, but if that child doesn't deserve a special present, I don't know who does. The big push now, besides the Handmade Sessions, is Pam de Groot's master level dyeing and felting workshop that will be held in Dingle, Co Kerry on June 17/18/19, 2011. The 17th will be a day of resist dyeing to prepare for the 18/19 felting days. Pam is Dutch by way of Australia and in Ireland for a short time. Her work is mainly in mosaic felting, which is comprised of individual panels of pre-felts that are inlaid or tiled and then felted into another, larger piece or garment (thus mosaic). Much of her work is in wearables and they are very beautiful; more examples can be seen here http://pamdegroot.blogspot.com/. The workshop will allow time for participants to dye the silk and felt pieces on the 17th and then make the prefelts on the 18/19 to end the weekend with a unique and fabulous piece (or two, if you are quick and ambitious!) to wear for the cold weather months. Pam also does quite a bit of natural dyeing and I am hoping that she brings some of the eucalyptus that is native to Australia as I have seem some of her work on her blog and the end result is really lovely. A day of experimenting with dyes and two days of felting with talented and interesting women--HEAVEN! Cost for the three days of master level work is just €150. A deposit secures your place and I have just a couple places left. Originally, I wanted to start organizing these workshops in Dingle as there isn't much outside of Dublin or Cork. It would be nice to have advanced level craft education on the West end of the country to make it more accessible. Kerry is off the beaten track, as they say, but it is also a wonderful place to visit and get inspired. The workshop fee does not include accommodation, but I can help with referrals. Many people are staying with friends in Dingle, so I wanted to keep the price as low as possible for participants. Lunch will be provided by the Goat St Cafe (http://www.thegoatstreetcafe.com/), which has a wonderful reputation and very good vegetarian/special diet food for people who need to consider those options (again, not included in the overall price, but their prices are fair). Great desserts, too! If you want more information regarding this workshop, please email me at sharon1_crandall@hotmail.com. We are over the Easter holidays, thank God. My son was quite happy to put on his uniform and walk to school. He was ready a half hour early! I think we definitely are both ready to get back to routine. I spent a manic amount of time in my studio trying to get ready for the Craft in Kerry craft fair and then the admin work to get the craft fair ready (with the help of the wonderful Fiona Crinnion and partner Ronán and Colleen Bowler). Nationwide has come and gone and it should be on tomorrow night (Wednesday May 4 at 7pm in Ireland, but you can view in on Player at www.rte.ie). I was happy enough with the feature and so we just have to wait and see how we end up after editing. The weather was beautiful on the day and we all came outside. Actually, it was too beautiful and people were down on the waterside part of town soaking in the sun and sea, but no matter. We made a start and it's onward and upward!! Craft Fair were handmade in Kerry. Now I need to get the Handmade Sessions on the map. If we are going to get started for the beginning of June, there's a good bit of work to get done. I have a flyer done, but we need to adapt that to a brochure and have leaflets printed for all the hotels and B&B's. We need to build a great table to work around and have a real kit the building out session. We don't need much to get started, so we might just squeak by on the cheap. It's a bit ambitious to get us started on this so soon after starting Craft in Kerry, but the time is now and I know it will work. There are also so many promising artisans that are not working and I am hoping that this will not only raise their profile, but also their income level!! We all need a boost and a break from the Irish economic doom and gloom. Lots of meetings to get through this week, but I am hoping to have a good answer on funding and getting our foot in the door soon to get the premises ready. A final pic of some of the journals that I felted for the craft fair. I am happy enough with them and hopefully they will be part of my off-season woolly stock.